The breasts are paired milk-producing organs in the upper ventral sides of the torso. They contain the mammary glands which secrete milk used to feed infants. More. Lymph vessels and nodes of the female breast. 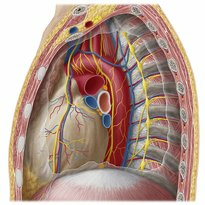 The mediastinum is found in the midline of the thorax and is surrounded by the left and right pleural sacs. Many structures are found within this area. More. The esophagus is a long fibromuscular tube connecting the pharynx with the stomach. Here we will learn the structures that pass alongside and supply this organ. More. 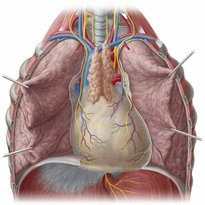 The lungs are two organs found within the chest cavity that are essential to respiration. There are many important structures associated to these organs. More. The heart is responsible for pumping blood all over your body. 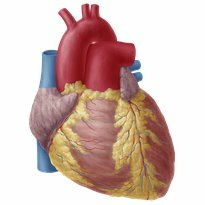 It is a vital organ that has a complex structure made of cardiac tissue and embedded vessels. More. 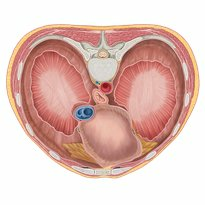 The diaphragm is a muscle residing within the trunk and separates the thoracic and abdominal cavities. Many structures pass through it, including blood vessels. More.